Here at The Ordinary’s home for over-used and worn-out metaphors, we’ve been visiting an old friend. We’ve been thinking of a metaphor, and we’re driving that tired horse the extra mile down well-traveled roads. It all started the other day when I described Malcolm’s mind as a vivid, teeming, beautiful place. I began thinking of it as a garden, I started to imagine what Malcolm’s garden would be like. I pictured it as a wild mix of different styles. In some parts it would be carefully planned and cultivated, and would yield delicious herbs and vegetables. In others it would be wild and unruly, full of raspberry bushes, say, delicious but prickly and hard to control. There would be gaps in the walls, hidden behind bushes or clever doors that Malcolm had fashioned from objects he’d found. These doors would open to secret passages, beautiful and rambling, which run for miles to unexpected places, alongside clear creeks. And Isaac’s garden would be bright and sunny, full of vibrant flowers and sweet smells. But there would be shadowy patches of skeleton flowers, or ghostly weeds or crazy jaggedy monstrous plants that look scary but would never really hurt you. His garden wouldn’t be hard to walk in, it would have plenty of paths, but they’d be meandering and twisting, and you’d never end up where you expect to. And my garden would be a miss-matched jumble. I would have started out carefully enough, drawing detailed plans in a little notebook, I would have chosen strange aromatic herbs and obscure fruits. I would have started with energy and good intentions, but somewhere along the way I would have gotten distracted or discouraged, and the flowers would never be as beautiful or the fruit as fruitful as I’d hoped. And I’d constantly be surprised by what I found in my own garden, forgetting that I’d planted something, or bewildered by some plant that had found its own way in and grown with wild gusto almost without me noticing. And sometimes this unexpected unremembered thing will be more beautiful than anything I’d planned. Like all gardens, ours will be dormant sometimes, seemingly bare under a layer of frost or snow, but beneath the soil all of the roots will be growing and alive. And like all gardens, we’ll have to be careful what we plant and what we allow to grow, and we’ll try to pull away the vines that choke everything healthy and vital. But we’ll never reject a plant because it’s not bright or showy enough or because somebody else calls it a weed. And we’ll understand that it’s good when our gardens are wild and alive and teeming, but it’s important for us to take care of them, and make plans for them, and forge paths through the brambles, so that we can share them with other people. We’ll revel in all the different moods and seasons, the sun and warmth and rain and frost, because we’ll know we need them all. Yeah. It’s an old metaphor, but the soil’s still good, it’s still got years of crops to harvest. Beets and sweets from the local farm! The season’s almost over, so we’ll make the most of it while we can. 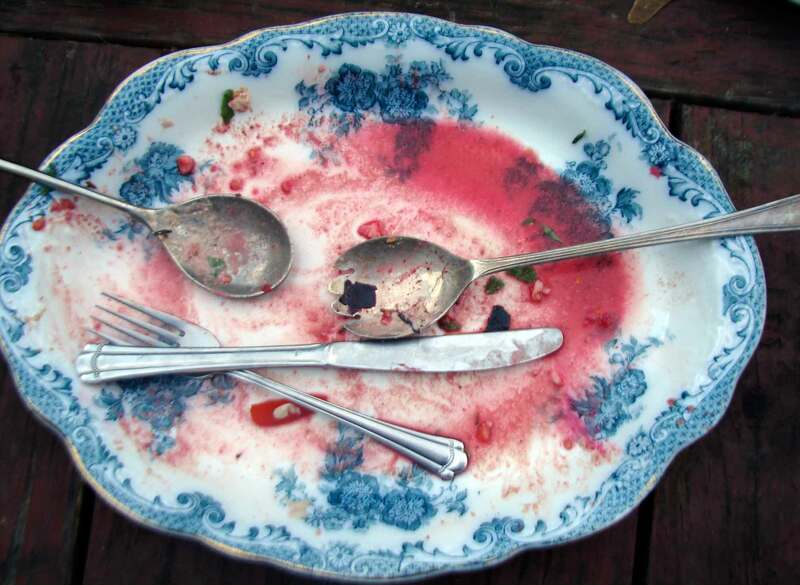 I sliced the beets and sweets and a few regular potatoes quite thinly. Then I roasted them till they were crispy. I lay these on a bed of baby arugula, and then piled them high with fresh tomatoes and basil (from the farm) and mozzarella, and then I drizzled the whole thing with a creamy vegan walnut tarator sauce. A sort of warm salad, perfect for this season of unexpectedly warm days and unexpectedly chilly nights. Here’s REM with Gardening at Night. Preheat the oven to 425. Toss the vegetable slices with herbs and enough olive oil to coat each piece lightly. Roast until soft inside and crispy and starting to brown outside…about 1/2 hour. Meanwhile, combine the tomatoes, mozzarella, basil, olive oil and vinegar, and leave to sit while the vegetables cook. Spread a pretty platter or big plate with the arugula. Arrange the roasted vegetables on top. Pile the tomatoes and cheese on top, season with salt and pepper. Drizzle the walnut sauce over everything. Soak the bread in water for a few minutes, and then squeeze the water out. Combine everything in a blender of food processor and blend till smooth. Add enough water to make it into a smooth, pourable sauce (about 1/2 cup, for me.) You want it to be about the consistency of heavy cream. 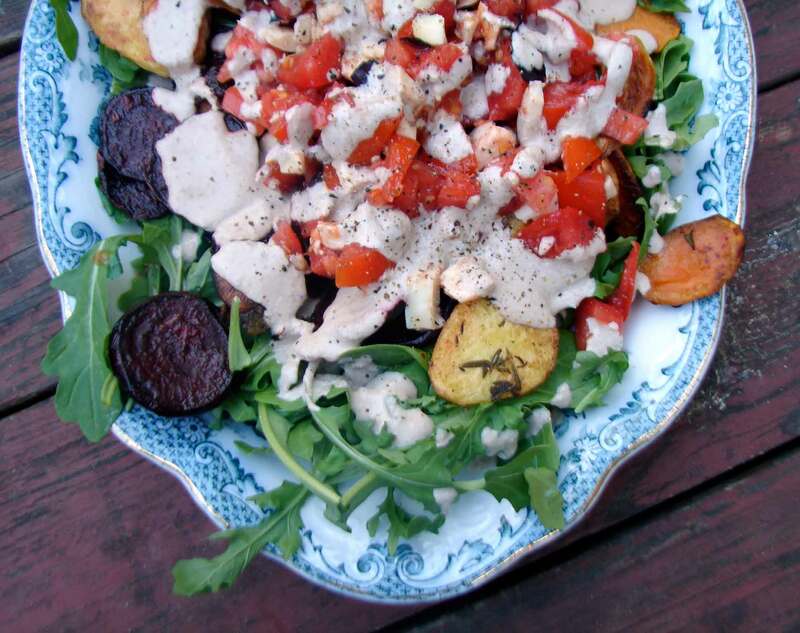 This entry was posted in potatoes, recipe, salad, tomatoes and tagged creamy vegan nut sauce, roasted beets, roasted sweet potatoes, tomato basil mozzarella, walnut tarator sauce, warm salad by Claire. Bookmark the permalink.